The main personalities of the period were the dictator Pibulsonggram (better known as Phibun), who allied the country with Japan during the Second World War, and the civilian politician Pridi Phanomyong, who founded Thammasat University and was briefly the prime minister after the war. A succession of military dictators followed Pridi's ousting — Phibun again, Sarit Dhanarajata and Thanom Kittikachorn — under whom traditional, authoritarian rule was combined with increasing modernisation and westernisation under the influence of the U.S. The end of the period was marked by Thanom's resignation, forced by a massacre of pro-democracy protesters, who were led by Thammasat students. Representatives of the government, opposition, House and Senate Tuesday took part in alms giving rite to commemorate the killings of students activist in the October 14 1973 uprising. PM's Office Minister Sukhumpong Ngonkham, Opposition leader Abhisit Vejjajiva, Deputy House Speaker Samart Kaewmeechai, Deputy Senate Speaker Nikhom Vairatphanit, and Bangkok Governor Apirak Kosayodhin took part in the rite at the Oct 14 monument. Sunee Chaiyaros, a member of the National Human Rights Commission, also took part in the alms giving. A girl walks past photos of those killed in the October 14, 1973 uprising at a memorial in Bangkok on Monday. 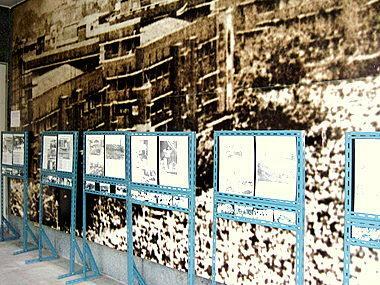 An exhibition is held there to mark the 35th anniversary of the uprising on Tuesday. 1973 victims: What about us? Victims of previous political violence, including the incidents of October 1973, are waiting quietly but anxiously for the Yingluck Shinawatra government to agree with their request for 1.2 million baht each in compensation. The Social Development and Human Security Ministry has agreed to a proposal for a lump-sum package instead of the monthly assistance now paid by the government, said Prawais Em-amorn, a key member of the Association of October 14 Relatives. The ministry has asked the elderly relatives and victims of the 1973 incidents to wait until the current payments to victims of more recent political violence have been made. Once the attention surrounding the current payments has died down, the ministry would seek cabinet endorsement for a package for others who suffered four decades ago, added Lamied Boonmark, the chairwoman of the association. Lamied’s husband Jira, a master’s student at the National Institute of Development Administration, was killed on Oct 14, 1973, during pro-democracy rallies that brought down the military government of Field Marshal Thanom Kittikachorn. While she welcomed the compensation for the families of the red-shirts, Lamied, 67, said she wanted the Yingluck government to speed up reparations to victims of state violence in the 1970s as well. 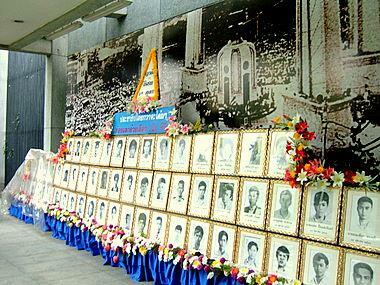 After Oct 14, 1973, the Sanya Dharmasak government set up a 30-million-baht fund, managed by the Foundation for the October Victims, to provide monthly support of 400 baht to relatives of the dead or injured. The fund closed in 2004, after which the Thaksin Shinawatra administration paid 250,000 baht to the families of each of those who died. "Some relatives did not want to get involved with the issue again, so they faded out, but some 60 people believe we have to group together to help each other in times of dire need, such as when someone is hospitalised or cremated," said Mr Prawais, 59. The Association of the 14 October Relatives previously sought help from the Abhisit Vejjajiva government. Sathit Wongnongtoey, then a PM's Office minister, promised them 7,000 baht per month in cost of living support. "The relatives have agreed [to settle for] a one-time final figure of 1.2 million baht, as we are already old and dying. Since early this year, three people have already passed away. This is the last request from relatives of those whom society calls 'heroes'," said Mr Prawais, who was shot by an M16 rifle bullet in the upper thigh. In another development, uncertainty has arisen in connection with compensation for some red-shirt members involved in the events of May 2010. It's not clear if those now charged with offences will receive compensation if they are acquitted by the courts. Jiem Thongmak and Arthit Baosuwan have just received a document from the Southern Bangkok Criminal Court to confirm that their cases have reached the final stage. The two were among seven defendants charged with violations of the emergency decree, robbery, and fighting against the authorities during the CentralWorld fire on May 19, 2010. In December 2011, the court acquitted the two of the two latter charges; they have confessed to the emergency decree violations. The pair have to wait until all possible appeals have been exhausted before they could obtain documents as free people. However, they still wonder if they would be entitled to receive the compensation from the Yingluck government. "This still excludes the jail term we have served. We were imprisoned more than a year longer than we should have been," said Mrs Jiem, 47. "The emergency decree violation carries six months' imprisonment but we were in prison for nearly two years." Victims of the Oct 14, 1973, uprising have once again voiced their plea for the government to give them a final compensation payment as the event's 39th anniversary approaches. The Association of Relatives and Survivors of 14 October 1973 has been wrangling with the authorities for almost seven years over their demand for a one-off payment of 1.2 million baht to its members who are now all elderly citizens. "There have been flip-flops in the bureaucracy as well as insincerity from politicians," said Prawais Em-amorn, a core member of the association. "The most recent victims [of state violence] have received compensation but their predecessors are still waiting for mercy from the government." Mr Prawais, 59, was referring to the payouts of up to 7.5 million baht made by the Yingluck Shinawatra administration to red-shirt and yellow-shirt protesters as well as victims of the violence in the deep South. After the Oct 14 uprising, which left 77 dead and hundreds injured, the government led by Sanya Dharmasak set up a 30-million-baht fund managed by the Foundation for the October Victims to provide monthly support of 400 baht to relatives of the dead or injured. The fund was exhausted and eventually closed down 30 years later in 2004. In March 2006, the government of Thaksin Shinawatra made a pact with the Oct 14 survivors and relatives to pay up to 3 million baht to each survivor and half a million to relatives of victims. But even this sum was not enough in the end, they said. "We were asked to sign papers forfeiting the right to demand compensation in the future," Mr Prawais said. "But the survivors and relatives, including victims' parents, have led a difficult life. So we are pleading with the government to consider giving a final lump-sum payment to them on humanitarian grounds." After much discussion, the Abhisit government agreed to pay the association's members 7,000 baht a month until death. However, the ageing and ailing members would rather settle for a final one-off payout. "Politicians are just preaching about democracy without really caring about the people who made real sacrifices and were affected by the fight for democracy," said Mr Prawais, who still has a big scar on his left thigh from M16 bullet wounds from 1973, a legacy of when the military regime of the time opened fire on unarmed pro-democracy protesters. During the past few years, 14 members of the association have died. Its membership is now down to 52. "We would like to live our final days with some dignity without getting into debt or becoming a burden on our descendants," said Mr Prawais. Ms Yingluck has turned down the request for the lump-sum payment and has stood by the monthly subsistence allowance deal. Lamied Boonmark, 67, wife of Jira Boonmark, a student from the National Institute of Development Administration who was killed on Ratchadamnoen Avenue during the 1973 demonstrations, said the association is not begging for money from the government. It is just asking for humanitarian support for the final days of its members, he said. Since 2003, parliament has recognised Oct 14 as Democracy Day, but those who struggled then have been abandoned by the generations who have followed in their footsteps, Ms Lamied said. Mr Prawais has urged members of the cabinet, whom he believes indirectly benefited from the landmark incident, to show up during the event's 39th anniversary commemoration on Sunday to see with their own eyes how relatives of the so-called "heroes" and "heroines" live their modest and difficult lives. Representatives of the government, opposition and relatives of the dead turned up at the October 14 Memorial at Khok Wua intersection Sunday morning to attend a ceremony to mark the 39th anniversary of the student uprising on Oct 14, 1973. A ceremony involving three religions - Buddhism, Christianity and Islam - began at 7am. Prime Minister's Office Minister Worawat Ua-apinyakul represented the prime minister at the ceremony. Other well-known figures attending the ceremony included Surachai Liangboonlertchai, first deputy Senate speaker, and Khunying Kalaya Sophonpanich, Ong-art Klampaiboon and Chamni Sakdiset of the Democrat Party. Parinya Thewanarumitkul, deputy dean of Thammasat University, said the new generation should take this occasion to pursue the intentions of the Oct 14 heroes to bring about true democracy to the people. Years of protests by students demanding democracy culminated in clashes with police on Oct 14, 1973 around Democracy Monument. Unable to control the large crowd attempting leave via Ratchawithi Road, police opened fire on them with tear gas and gunfire. The military was called in and took over Ratchadamnoen Avenue, while helicopters fired at Thammasat University. Then prime minister Field Marshall Thanom Kittikachorn was forced from power, but not before at least 77 people were killed and more than 800 wounded. Unable to control the large crowd attempting leave via Ratchawithi Road, police opened fire on them with tear gas and gunfire. 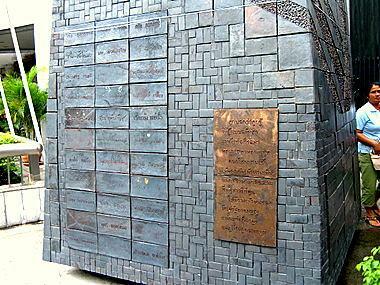 The 14 October 1973 Memorial in Bangkok was erected to preserve the memory of those who were killed on that fateful day when thousands demonstrated against the military dictatorship. It stands at the junction of Central Ratchadamnoen Avenue and Tanao Road, not far from the Democracy Monument where most of the demonstrators were gathered back in October 1973. The memorial, a conical structure rising from a rectangular pedestal, is at the center of an elevated arena shaded by trees and plants in the outer perimeter. A poignant inscription at the pedestal expresses the sorrow of lamenting parents waiting in vain for the return of their missing children whose names are inscribed on the sides. 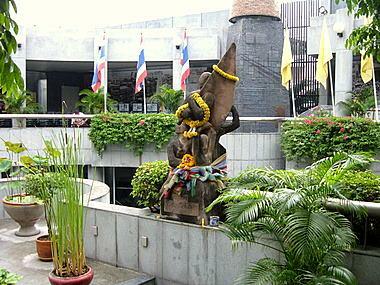 A museum has been constructed as an extension of the 14 October 1973 Memorial and it's divided into three levels. The first level is the elevated arena and garden, with an exhibition area for photos of the October revolution behind the memorial. The photos are a stirring record of the tumultuous days in October 1973; tens of thousands massing at the Democracy Monument, the violent military response, masses of demonstrators running for their lives and jumping into canals, the courage and defiance as some fought back using buses to block tanks and the tragic aftermath. A spiral staircase leads to the 14 October Foundation in the mezzanine floor below and then to the basement with the office and library. Every year on 14 October, services will be held at the memorial to commemorate the occasion and the sacrifices of those who lost their lives during the October revolution in 1973. Those who gave their lives "Democracy achieved at the price of blood, flesh and lives." 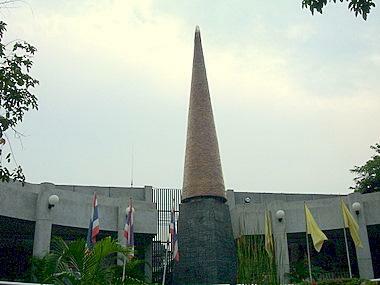 The 14 October 1973 Memorial serves as a stark reminder of a grim period in Thai political history and a dedication to the brave young men and women who stood up and died for a cause. compare their commitment to the assholes out on the streets today. Quite the dichotomy from paid protesters and people going for the free food and drink on both sides. They weren't your mother's Boy Scouts, but different Scouts. One of a few of nationalist subversive organizations created in the 1970s. All, in pure form, still exist today. Keeping the status quo where it belongs. Yes, the village scouts, formed to fight the communist insurgency, and evolved into t he right wing fascist groups like Aphirak Chatri and Red Gaur, which caused havoc during the 1992 violence. You certainly wouldn't be expecting anything else, would you. A most common and useful tool throughout all societies. Promoting the goodness in their respective histories....nothing dark or negative - which all cultures/countries have ten fold. It's the nature of convention to bring the most positive.....therefore: revision, suppression, and omission of truer historic content is applied and accepted by the masses.